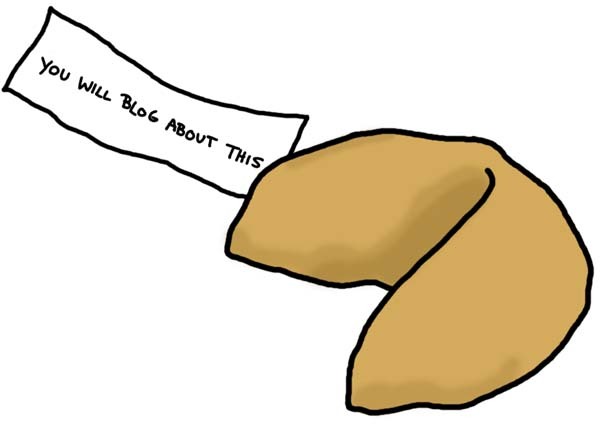 I am a real fan of fortune cookies, I go to Asian restuarants just so I can get a fortune. One day my dear friend Angela María told me that if wanna have real good luck, I am to read my fortune and add “in bed” at the end of it. No matter the fortune, after my experience I have to say that IT ALWAYS WORKS. ¿Te acuerdas de las que te llevamos del día en Philadelphia? March 4, 2010 at 19:43. Permalink. Cogí todos los papelitos y los metí en la paella que hice a los de mi clase en Nueva York y fliparon un poco. March 4, 2010 at 19:47. Permalink. March 6, 2010 at 17:32. Permalink.